My life with the Cardboard Gods and the games they play. Anders Carlsson was the first Swedish player to be drafted in the 1986 Entry Draft, 66th overall by the New Jersey Devils. Anders, whom had played professionally in Sweden since 1979, was 25 years old when he was drafted. In the spring before the draft, Anders led Team Sweden to a Silver medal in the World Hockey Championships. Anders led team Sweden, and finished 7th overall, with 12 points. Anders started the season on the second line with Aaron Broten and John MacLean but did not produce as expected. He was held pointless until Nov 6th, and did not score a goal until Jan 26th, which occurred after a brief demotion to the AHL. Anders spent more time in the minors than the NHL the two following seasons. 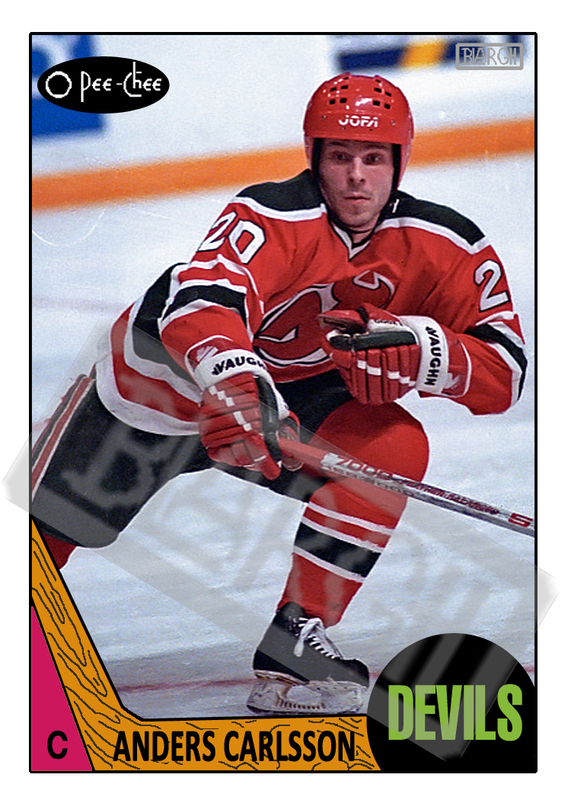 He did see action in 3 play-offs games during the Devils Cinderella run to the Conference Finals in 1988. He was credited with the game-winning goal against the Washington Capitals during Patrik Sundstrom's NHL play-off record 8 point game. Anders was never able to secure a full-time position in the NHL, and would return to play in Sweden in 1989. He retired in 2000, at the age of 40. 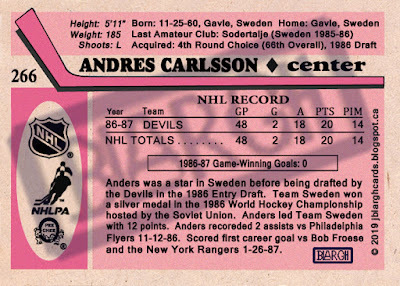 While Anders Carlsson had a few cards produce of himself in 90s while in the Swedish hockey league, he never had a NHL hockey card during his short NHL career, or after. 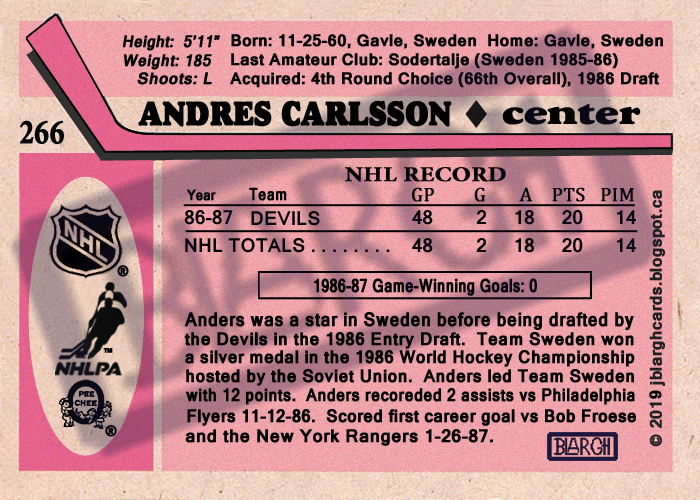 Below is my version of a 1987-88 OPC Anders Carlsson rookie card. 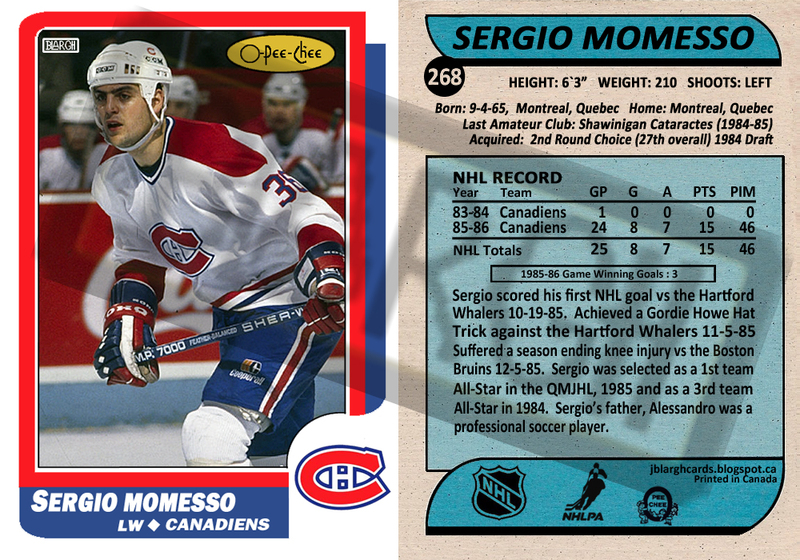 Sergio Momesso played 13 seasons in the NHL. A player with a mean streak, Sergio was a highly touted, and scoring, junior hockey player who never lived up to lofty expectations in the NHL. After picking an American, Alfie Turcotte, in the 1st round, 17th overall, in the 1983 Entry Draft, the Montreal Canadiens drafted Quebecois with back-to-back picks with the 26th, Claude Lemieux, and 27th, Sergio Momesso, overall selections. Momesso made his debut as an 18 year old in 83-84, but only played a single game, getting to play on a line with Guy Lafleur and Bobby Smith. Momesso would return to the NHL in 85-86 but suffered a season ending knee injury against the Boston Bruins after playing 24 games for the Habs. Momesso's time with the Habs would be injury plagued, never playing more than 59 games in a season. Sergio would eventually be traded to the St. Louis Blues, in a deal that netted the Habs, Claude Lemieux's brother, Jocelyn. After another injury plagued season, 53 gp, he set career highs with 24 goals and 56 points in 1989-90.. He had a career night on October 18, 1989, scoring 2 goals and 4 assists in a 9-3 St. Louis Blues thrashing of the Pittsburgh Penguins. Sergio was traded to the Vancouver Canucks in a very lopsided trade deadline deal. Sergio, Cliff Ronning and Geoff Courtnall would be part of the 1994 Canucks team that reached game 7 of the Stanley Cup finals. On the other hand, the key player going to the Blues, Dan Quinn, would be involved in another significantly one sided deal during the subsequent off season. After the Canucks, Momesso would play briefly with the Toronto Maple Leafs and New York Rangers before returning to the St. Louis Blues to finish his NHL in 1997. Sergio's official rookie cards would come in the 1990-91 sets as a St. Louis Blues. 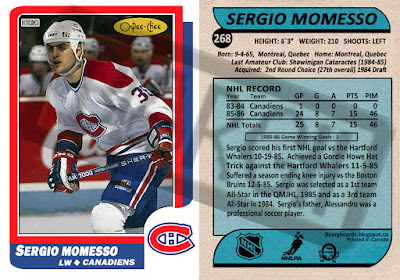 Below is my version of a 1986-87 OPC Sergio Momesso rookie card. 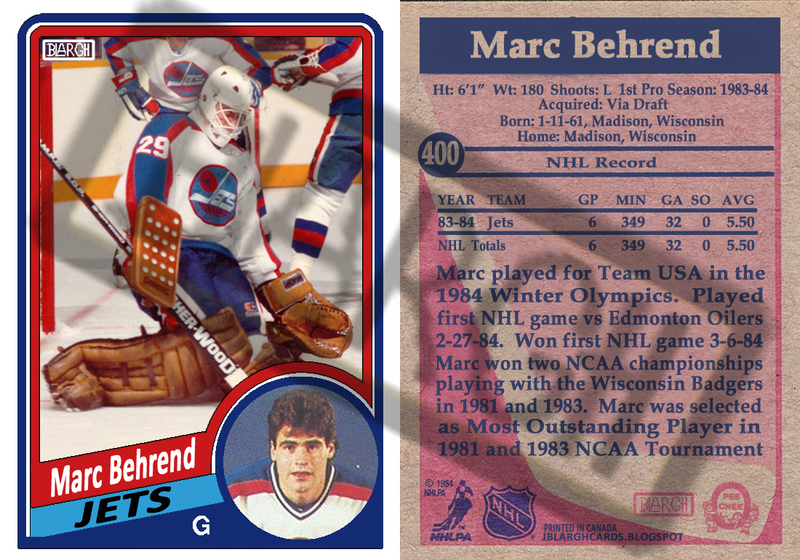 Marc Behrend was drafted by the Winnipeg Jets, 85th overall, in the 1981 NHL Entry draft. Behrend was the 10th goalie taken in the draft. At one point, three of the goalies taken before Behrend were in the top ten for career wins by a goalie. Those goalies were drafted by the Oilers, Flames, and Rangers. It took a few years for Behrend to make it to the NHL. 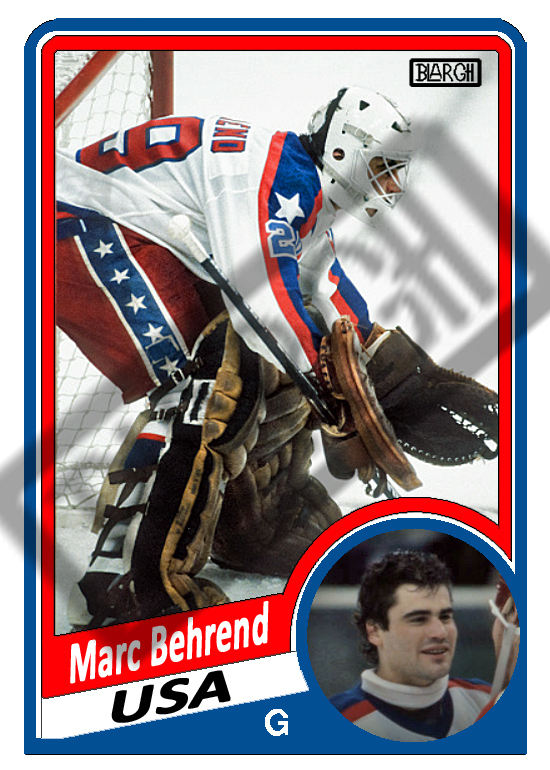 Behrend played college hockey for the Wisconsin Badgers, and won NCAA championships in 1981 and 1983. Each time, Behrend was selected as the tournament's Most Outstanding Player. He is the only player to win the award multiple times by himself. Lou Angotti also won the award twice, in 1960 and 1962, but shared the award with two other players in 1960. Marc would make another stop before joining the Jets in 1984. Behrend played for Team USA in the 1984 Olympics. There was no medal for Behrend, as the team finished seventh. Behrend made his NHL debut a week later and his first NHL start was a 6-5 overtime lose to the Edmonton Oilers. About another week later, he recorded his first win, a 7-3 pounding of the Los Angeles Kings. Teammate Dale Hawerchuk set a NHL record that night by recording 5 assists in a single period. Marc would retire from professional hockey in 1987 and become a firefighter in his hometown of Madison, Wisconsin. He never received an NHL card, and only had a single team issues card while with the Jets. Below is what a 1984-85 OPC Marc Behrend rookie card may have looked like. I also decided to through in a bonus card. A 1984-85 OPC Olympic subset of Marc Behrend. The diminutive Richard Brodeur, 5'7", was a fan favorite during his time with the Vancouver Canucks. He backstopped the 1982 Canucks all the way to the Stanley Cup Finals against the New York Islanders. The Canucks stormed their way through the play-offs, only losing two games through the first three rounds. The Cinderella story fell short as the juggernaut Islanders swept the Canucks in the Finals. Brodeur was originally drafted by the New York Islanders in the 7th round of the 1972 draft but opted to sign with the Quebec Nordiques of the fledgling WHA. Brodeur won an Avco Cup, the WHA league championship, with the Nordiques in 1977. When the WHA folded in 1979, the Islanders, who still owned Brodeur's rights, struck a deal with Nordiques. The Islanders left Gerry Hart unprotected in the expansion draft and then sent goalie Goran Hogosta to the Nordiques for Brodeur. Brodeur would see limited action in two games during his single season with the Islanders, as third string goalie behind Billy Smith and Chico Resch. Prior to the 1980 waiver draft, the Islanders, instead of risking losing Brodeur for nothing, traded him to the Canucks in a deal that include a swap of 5th round picks. Brodeur would be the Canucks top goalie for the next several seasons. The Canucks were a fairly bad team during those several seasons. In a division with the Gretzky and Oilers, Dionne and the Kings, Hawerchuk and the Jets, and McDonald and the Flames, Brodeur and the Canucks goalies found themselves basking in the red light quite often. Brodeur led all NHL goalies in most goals allowed twice, 1985 and 1986. Although the Canucks suffered through much of the 1980s, Brodeur will be most remember for his superb playoff run in 1982. Brodeur would become expendable in 1987, when the Canucks acquired Kirk McLean, who would also led the Canucks to a Stanley Cup final. Brodeur was traded to the Hartford Whalers for another goalie, Steve Weeks. Brodeur would play six games for the Whalers, as well as four in the play-offs. After failing to make the team out of training camp in 1989, Brodeur hung up his skates after playing several games in the AHL. Post retirement, Brodeur has become an accomplished artist. 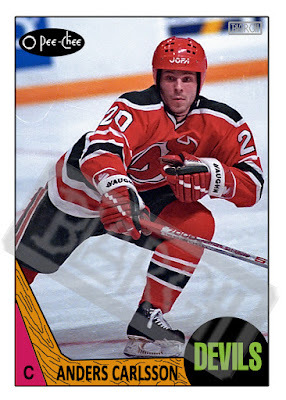 Richard Brodeur never made the cut for the 1988-89 OPC set. 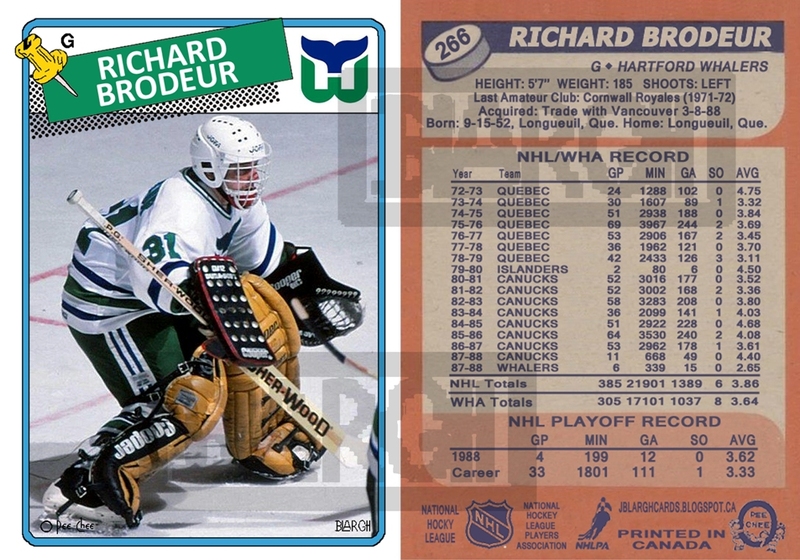 Here's the 1988-89 OPC Richard Brodeur card that might have been. Last year I got an e-mail request for a Michel Petit 1984-85 OPC Card. I never got a reply back from the person requesting the card, but after I realized that card would fit perfectly into the Lost Rookies, I made it anyways. Petit, a tough stay-at-home defender, played 16 seasons in the NHL from 1982 to 1998, including six seasons with the Vancouver Canucks. Petit played for 10 different teams in his career. In his last three seasons, Petit played on five different teams. When Petit retired, he held the record for most franchises played for, a record since broken by Mike Sillinger. Petit played for a lot of bad teams during his injury plagued career, including the historically bad 1989-90 Quebec Nordiques. In 1990-91, he had a league worst plus/minus of -34, splitting time between the Nordiques and Toronto Maple Leafs. During his sixteen seasons, Petit played in the play-offs five times. Four times his team was eliminated in the first round. Petit did play two games in the 1997 Stanley Cup with the Philadelphia. Petit got to play after multiple injuries to Flyers defencemen depleted the team. The Flyers were swept by the Red Wings in those finals. 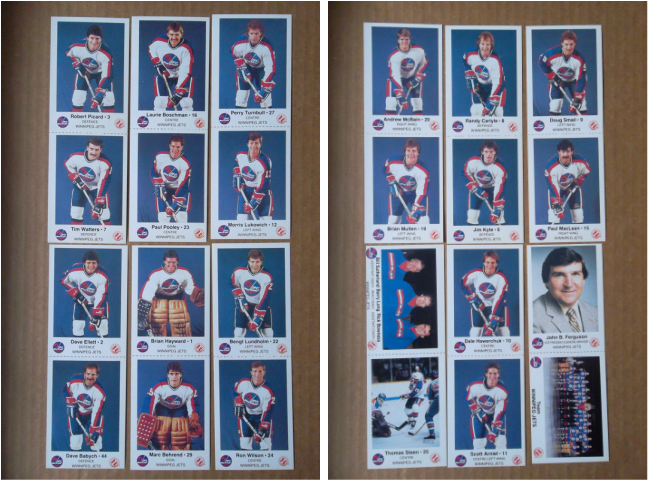 Michel Petit would have a rookie card with the "New York Rangers" in the 1987-88 OPC set. A card in which had his name misspelled. For a player who had a 16 year career, Petit only had cards in 7 years, including no cards with his last seasons/teams. 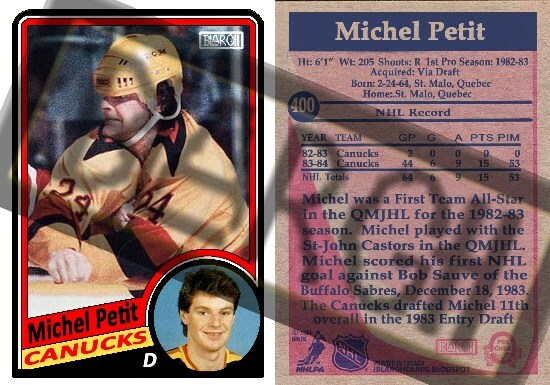 Below is what a 1984-85 OPC Michel Petit rookie card may have been. I have been sitting on this post draft for a few years. Originally I was planning on sending this card out to get signed via TTM. Maybe even try to score an interview. The blog has been largely dormant for the past few years, so my original hopes of getting interviews are long gone. Now I just wonder who actually read this. Regardless, I still a few cards I haven't shared, and perhaps will make a few new ones as well. Tim Tookey was inducted to the Hall of Fame in 2008, AHL Hall of Fame that is. A skilled offensive threat, Tookey was never able to secure a roster spot in the NHL. He played in parts of seven NHL seasons while playing for five different teams. His best season came was his rookie season in 1980-81, in which Tim netted 23 points in 29 games. The points and games were both career bests for Tookey. Tookey had cups of coffee in Quebec, Pittsburgh, Philadelphia and Los Angeles, before retiring from professional hockey in 1995. He spent the majority of his professional career as a Hershey Bear in the AHL. In the AHL, Tookey topped 100pts in a season three times and was league MVP in 1987. A highlight in Tookey's NHL career came in a 10-4 victory over the Philadelphia Flyers on November 21, 1981. Tookey, and teammate Denis Maruk, both recorded Hat Tricks in that game. 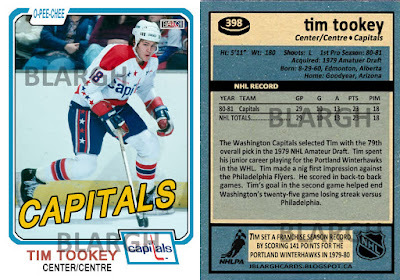 Tim Tookey never had a NHL card. Below is a custom 1981-82 OPC rookie card of Tim Tookey. 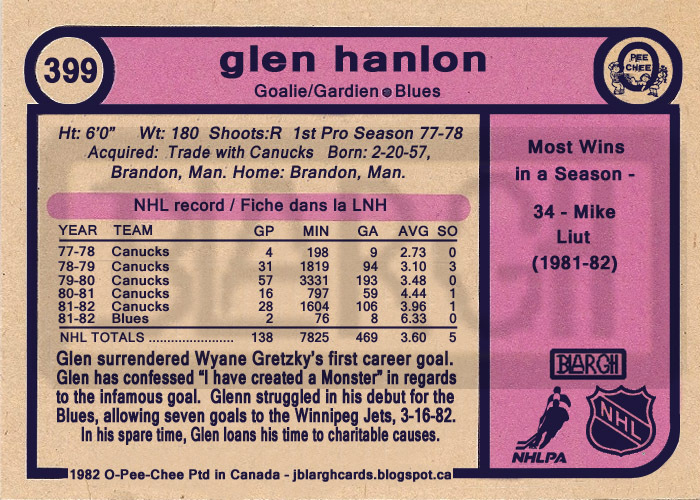 I will forever remember Glen Hanlon for his oddly shaped helmet, even more so than his crotch grab card, which I pulled out of a pack as a child. One thing that many may not remember is Hanlon's time with the Blues. 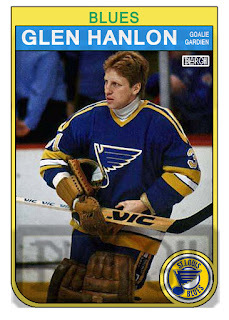 Acquired from the Canucks at the 1982 trade deadline, the Blues had hoped Hanlon would provide support for starting goalie, and All-Star, Mike Liut. 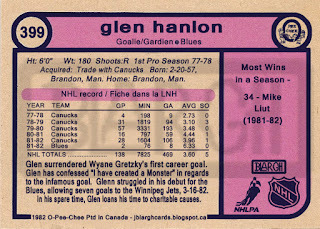 Instead Hanlon quickly played his way out of St. louis, beginning with surrendering seven goals in his Blues Debut vs the Winnipeg Jets. Hanlon was traded to the New York Rangers during the 1982-83 season. Hanlon faired much better with the Rangers, and then Detroit Red Wings, where he led the league in Shutouts with 4 in 1987-88. Hanlon retired from the NHL after being left unprotected and then passed over in the 1991 expansion draft. I have been collecting cards on and off since 1987. I have recently started to design custom cards for fun and also custom pics for TTM. This is how it went.